You don’t need an abundance of space to create a chic bathroom. All you need is a few expert tips on design and style, and you’ll be able to infuse the feeling of luxury in even the littlest of rooms. From space-enhancing secrets to storage-tackling tricks, this guide has a list of bathroom design ideas for your home. When designing your bathroom it is important to utilise the area wisely. An excellent alternative to conventional shelving, a shower niche is recessed into the wall. Perfect for placing all your bath essentials, a shower niche can store your shampoo, conditioner, and body wash without protruding on your precious shower space. On top of that, the small and functional shelf also appears sleek and minimal, adding to the stylish design of your bathroom. 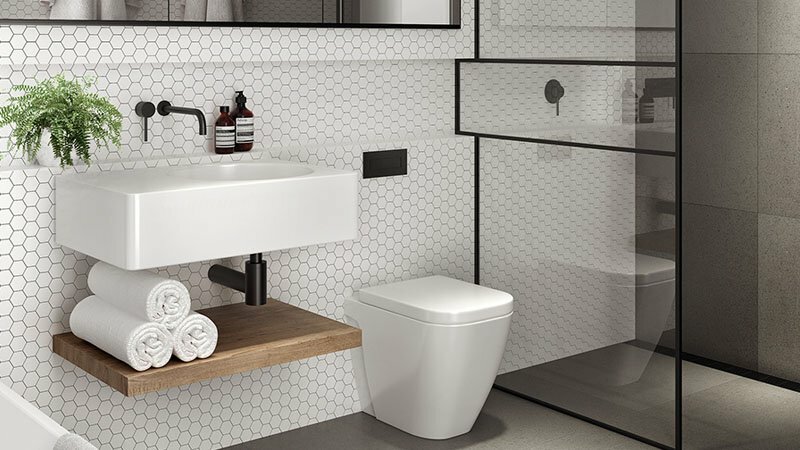 Utilising areas in your bathroom that are otherwise unusable is an excellent way to maximise your storage without sacrificing the feeling of space. In particular, adding a cabinet beneath your basin or sink will create plenty of useable room in a space that would otherwise be redundant. 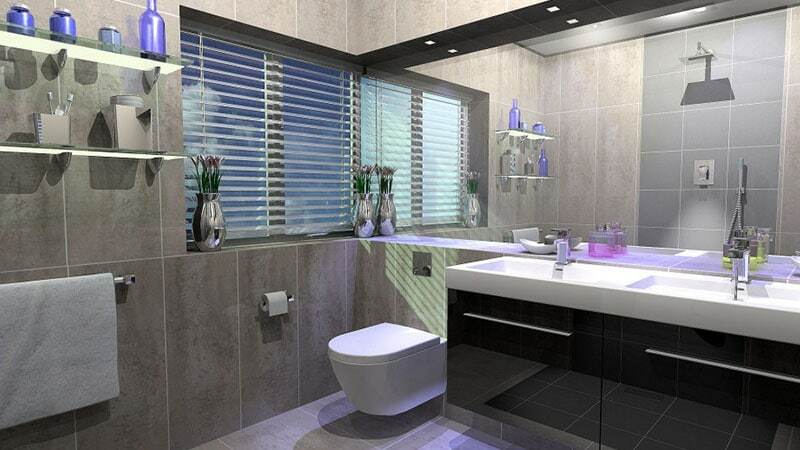 While you will have to sacrifice the appearance of a floating sink, you’ll be able to conceal any pipes and gain a great space for all your bathroom essentials. Also, adding convenient storage right below your basin means that there is no need to have a cluttered countertop, which in turn helps to create a more spacious feeling. Investing in quality design and combining it with minimal styling is an excellent way to create the feeling of space in a small bathroom. 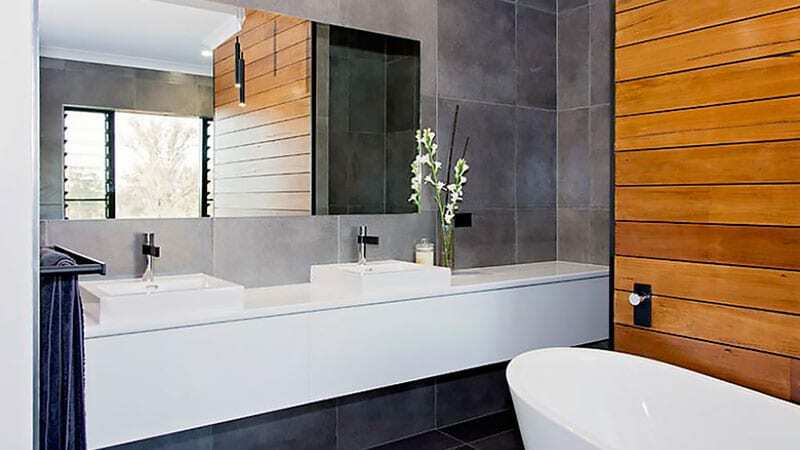 As such, the floor and wall coverings you choose for your bathroom can play a significant role beyond style. While large titles will help create an uncluttered feel in a small bathroom, horizontal stripes or panelling can stylishly add the appearance of extra length or width. Investing in an extra-large mirror for your bathroom will have significant benefits. Not only are large mirrors ideal for practical purposes but they can also help to create the feeling of spaciousness in small areas. Thanks to their light-reflecting capabilities, big mirrors can make even the tiniest of rooms feel comfortable in size. While built-in mirrors will achieve the best results and have a nice contemporary appeal, any extra-large design with a minimal frame will do the trick. Natural light is one of the best tools for making a room feel spacious, so embrace it in your small bathroom with large windows. If privacy dictates that you must have curtains or blinds in the room, invest in a pair that is either light-weight and white or retractable. By simply letting some sunshine in, you’ll transform your bathroom from dark and dingy to open and airy. When it comes to creating the feeling of space in a small area, nothing beats a white and bright colour palette. Also useful for rooms that lack natural light, a white colour scheme will brighten your bathroom exponentially. To keep things from feeling too sterile, add a glamorous touch with silver fittings, marble tiles, and glass. Then, add a pot plant or two for a dash of colour and life. Storage can be a tricky thing to have in a small bathroom without making the area feel crowded. As any cupboards, shelves or drawers will intrude on the space of the room, you need to be careful about what you choose to use. A simple box is an excellent way to add storage to your bathroom while saving space. Thanks to its flat top, the cube can act as not only a storage space for towels but also as a stool and side table to the free-standing tub. Although you may be tempted to separate your small bathroom into different sections, you should refrain. The best way to create a spacious feeling is to leave your bathroom as one open space that freely flows from one area to the next. This flowing space should also include your shower, which should feel like a natural part of the room. To create this feeling, it’s essential to use the same floor tile throughout both the bathroom and the shower. 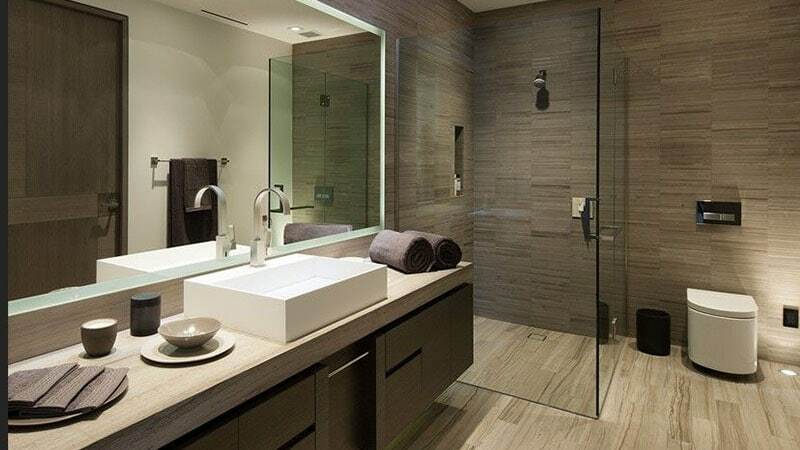 Doing so will allow your bathroom and shower to appear as one large, open space instead of two separate smaller ones. 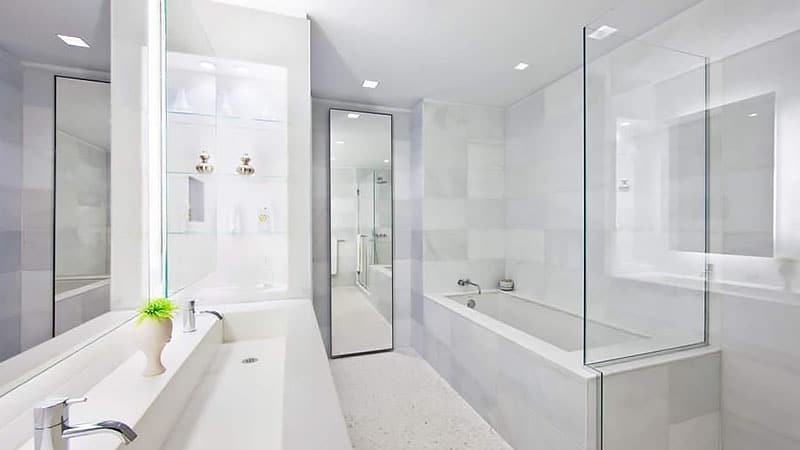 Choosing a clear glass shower screen is also important for merging the two spaces into one. The addition of a towel rail in your bathroom is an excellent practical choice. 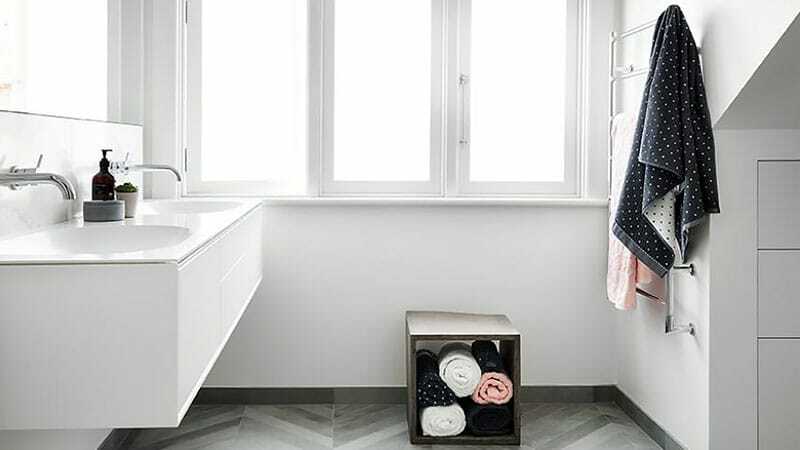 Unlike hooks, which can each hold only one towel and take up extra space in a messy way, a rail can hold multiple towels in a neat and space-saving manner. Choose a towel rail that runs vertically instead of horizontally for the best results in a small space. Doing so will create plenty of hanging space for towels without requiring too much wall area. 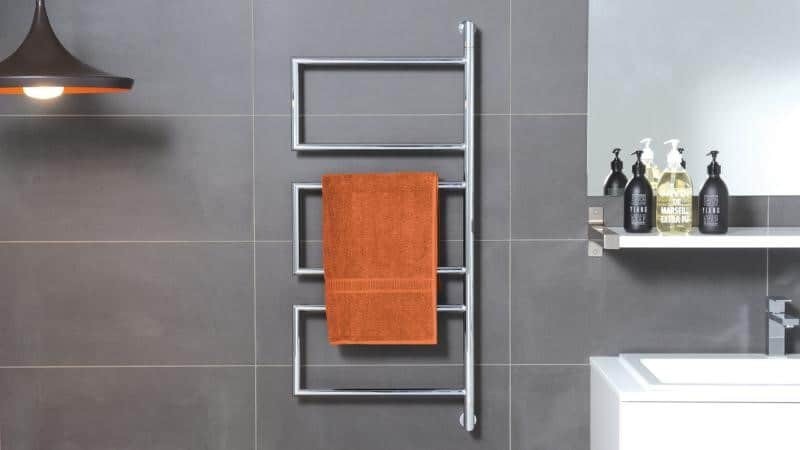 You should also choose a towel rail that can become a design feature of your room. Then, stock it with your best towels for a rail that’s both practical and stylish. 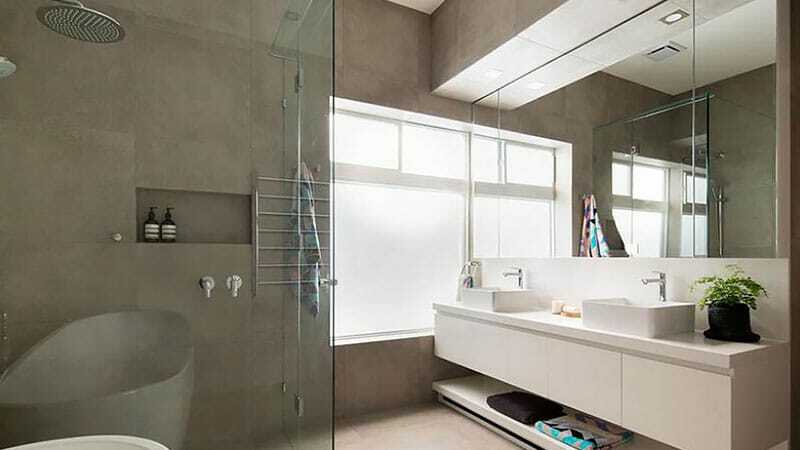 Utilise natural light, mirrors, and a white colour scheme to enhance the feeling of space in your small bathroom. Create the sense of one open space by continuing your floor tile into the shower. Save on shower space by including an inset shelf for your bath essentials. 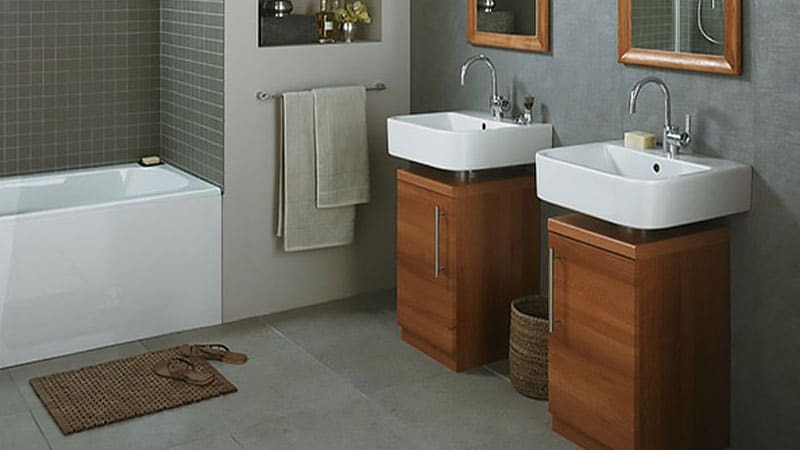 Make the most of your bathroom with multi-purpose storage ideas. Add additional storage in otherwise redundant spaces, such as under the basin.